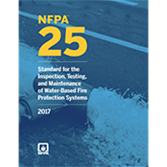 Adopted in many states, NFPA 25 helps users inspect, test, and maintain water-based fire sprinkler protection systems. The 2017 edition includes revised and updated ITM tables and major changes that improve usability for owners and service providers. Comprising the bulk of commercial and residential installations, fire sprinkler systems are highly effective against fire. However, to function correctly, these complex systems require close attention to mechanical issues and other important details. The 2017 edition of NFPA 25, Standard for the Inspection, Testing, and Maintenance of Water-Based Fire Protection Systems is the new industry benchmark, with comprehensive requirements for maintaining suppression systems for peak performance. This edition helps building owners, facility managers, inspectors, and service providers work together to maximize protection. NFPA 25 is so important to sprinkler system effectiveness, NFPA 13, Installation of Sprinkler Systems requires that installers leave a copy of NFPA 25 with property owners. ITM regimes covered by NFPA 25 include evaluation techniques such as fire sprinkler inspections, valve status tests, internal piping assessments, fire pump operating tests, fire pump flow tests, forward-flow tests for back-flow preventers, risk assessment and performance-based testing programs, preparing preplanned impairment reports, hydrant flushing, and testing. New residential sprinkler replacement requirements address sprinklers that are no longer available. New requirements clarify steps to take if inspections reveal missing escutcheons, or if listed escutcheons are no longer available. Added criteria cover automated inspections and testing. Significant changes in Chapter 13 address waterflow alarm devices, preaction and deluge valves, air compressors, and general pressure gauge criteria. Fire pump terms are aligned with NFPA 20, Installation of Stationary Pumps for Fire Protection. New Annexes address connectivity and data collection, and color-coded tagging programs. System maintenance saves lives and property--and is far less costly than system replacement. Interested in other editions of NFPA 25? Use the drop down menu above to select the edition year you need. 3.4 Deluge Foam-Water Sprinkler and Foam-Water Spray Systems Definitions. 3.6 Water-Based Fire Protection System Definitions. 3.7 Inspection, Testing, and Maintenance (ITM) Task Frequencies. 4.1 Responsibility of Property Owner or Designated Representative. 7.2 Inspection and Corrective Action. 8.6 Component Replacement Testing Requirements. 9.5 Automatic Tank Fill Valves. 10.2 Inspection and Maintenance Procedures. 10.4 Ultra-High-Speed Water Spray System (UHSWSS) Operational Tests. 13.3 Control Valves in Water-Based Fire Protection Systems. 13.5 Pressure-Reducing Valves and Relief Valves. 14.2 Assessment of Internal Condition of Piping. 14.3 Obstruction Investigation and Prevention. 15.7 Restoring Systems to Service. 16.2 Small Residential Board and Care Occupancies. Prevent fire tragedies and loss with sprinkler care based on NFPA 25. Improper maintenance of automatic sprinkler systems can result in less effectiveness, reduction of service life, or even catastrophic failure. That's why maintenance professionals, inspectors, and building owners rely on NFPA 25: Standard for the Inspection, Testing, and Maintenance of Water-Based Fire Protection Systems. Maximize time and efficiency without compromising reliability with requirements governing fire sprinkler systems -- including foam-water and fixed water spray systems, standpipe and hose systems, fire pumps, fire service piping and appurtenances, and water storage tanks. The Standard is so essential to proper sprinkler care, it's adopted by jurisdictions nationwide, and NFPA 13 requires installers leave a copy of NFPA 25 with property owners. The 2014 edition of NFPA 25 offers comprehensive guidance on maintaining suppression systems for optimum performance, and this edition introduces an expanded scope that includes water-mist systems. Changes include updated fire pump operating test-frequency rules; new fuel-supply testing procedures for diesel-driven fire pumps; a modified definition of "sprinkler system" for consistency with NFPA 13: Standard for the Installation of Sprinkler Systems; clarification about inspecting the insides of sprinkler pipes; as well as the addition of valve status testing to ensure water is reaching the sprinkler system. The 2011 edition of NFPA 25 clarifies the role the Standard plays in a fire protection plan. New terms in this edition define "critical deficiencies" and "noncritical deficiencies," so maintainers and owners can accurately identify corrective actions and prioritize repairs. Updated testing frequencies are based on the growing database of inspection, testing, and maintenance records. Other revisions clarify the roles and responsibilities of the building owner and the designated owner's representatives, to avoid critical oversights in sprinkler care. New Annex E classifies sprinkler repairs and has examples of sprinkler repairs and their classifications based on the new terms. A new Hazard Evaluation Form in Annex F helps you identify how building renovations could impact the adequacy of fire protection systems. The 2008 edition of NFPA 25 introduces guidelines for a performance-based testing option that offers alternate, flexible means of compliance. While the previous edition of the Standard included performance-based testing on a limited basis in the "equivalency" option, the 2008 edition presents practical guidance on how to implement and monitor the process, subject to approval by the Authority Having Jurisdiction (AHJ). New coverage includes what variables to take into account when adjusting frequencies, which factors to consider in the transition to a performance-based test program, and how to establish a failure rate -- complete with suggested calculation methods and examples. Other changes include new component replacement testing tables for each type of water-based system, first-time coverage of dry pipe system testing, a new chapter on water mist systems maintenance, and a new impairment procedures requirement. The 2002 edition of NFPA 25 adds new testing requirements for dry sprinklers, revised 5-year water tank inspection requirements, and new timing for testing of waterflow and supervisory switches. Other changes permit the use of ultrasonic (UT) and radiographic (RT) examinations to comply with obstruction investigation provisions. The 2002 edition also expands guidance for detecting Microbiologically Influenced Corrosion (MIC) and strategies for treatment.